My month in the countryside was a rare opportunity to spend an extended period observing and experiencing the lives of the residents of a remote village that is home to people from the Miao ethnic group. Before I arrived in Shibadong, in Huayuan, Hunan province, I was expecting to find a stereotypical ramshackle village. At least, that's what my knowledge and impressions of villages in other poor, mountainous regions had led me to believe. However, during my interviews with villagers, I learned that Shibadong was indeed once run-down, but that was several years ago. Present-day Shibadong is totally different, and it offered surprises from the beginning of my trip to the end. The road to the village is a well-built blacktop which zigzags along the mountainside and overlooks a valley. 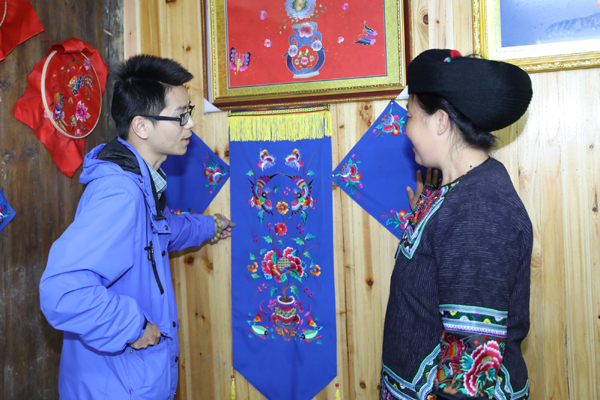 The village is clean and tidy, and the traditional-style wooden houses are well maintained. Located at the top of the mountain, the superb views, lush greenery and clean air make the village a popular destination for tourists. However, you have to learn from the villagers' own mouths how they and their ancestors suffered from a lack of arable land, inconvenient transportation links and a dearth of clean drinking water - the main causes of poverty. That was before the changes that have happened in the past few years. The first road capable of being used by motorized vehicles was built in 2001 by mobilizing the entire village under the guidance of the old village chief Yang Wuyu. Before that, only narrow mountain paths existed. "We dug the road hoe by hoe, and it took three years to complete," recalled Yang, adding that many senior villagers used crutches to attend the completion ceremony, where they saw a car for the first time.